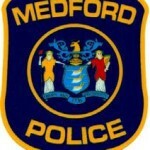 On July 27 at 12:57 p.m., a Medford Township Police Officer, while stationed at the Motor Vehicle Service, 175 Route 70, Medford, was alerted by Motor Vehicle Commission personnel that a subject, had provided a Social Security Card for identification purposes and the card appeared to be fraudulent. Police investigated the incident and confirmed that the Social Security Card was fraudulent. The man was placed under arrest for presenting a false government document. He was processed and released on a summons complaint pending a court hearing.